Salutations, readers. I’m ensconced under my scuppernong arbor tap, tap, tapping away on the old Royal, preparing a review for Now Smell This. I must hurry; the mailman will arrive shortly and my review must be ready. It’s so trying, typing whilst thinking of the hens’ yard that needs sweeping, the cardoon bitters I must brew, the yarn I’m dyeing in my new aluminum livestock tub. I also have a “note to self” here that’s hard to read (the ink’s smeared…I only use fountain pens, you see). Oh, yes, I remember: I wanted to sincerely apologize to you all for being so masculine (an awful thing indeed). Apology accepted? Calvin Klein PR says Calvin Klein Encounter is “modern, stylish and unapologetically masculine” just like its front man Alexander Skarsgård. Since I dislike Encounter so much, I must be Alexander’s opposite: old-timey, “homey” and ashamed of my masculinity. Any other men out there who are apologetically masculine on a regular basis? Take a whiff of Encounter and get back to me! Encounter was developed by perfumers Honorine Blanc and Pierre Negrin and includes fragrance notes of mandarin, cardamom, pepper, jasmine, patchouli, rum, cognac, agarwood, Atlas cedarwood and musk. As I sniffed Encounter’s rather “bare” fomula, I returned to that list of notes…and laughed. Encounter opens with noticeably phony mandarin combined with menthol-y cardamom: together these two notes give off a “minty” vibe. If you pay CLOSE attention, you may get a whiff of pepper (sprinkled on lots of warm, indistinct wood notes). Oud? Uhhhhh…. In mid-development I smell a mildly floral, strongly synthetic note that may stand in for “jasmine” (it arrives and departs quickly). The cognac and rum are missing (I think), or are they the nose-searing “alcohol” notes I smell that are like the fumes emanating from jugs of homemade liquor that would kill you if you drank more than a cup of it? Modern, and feminine, patchouli (how could this “apologetic” note appear in Encounter?) lingers in the perfume's base with more sheer woods and musk. On paper, Encounter smells like wood-mint mouthwash (more ‘interesting’ than on skin). Is there a designer perfume division that puts out more crappy men’s fragrances than Calvin Klein? Hugo Boss is its equal, but not worse. Ralph Lauren, Tommy Hilfiger and Dolce & Gabbana also love bland, mainstream formulas and pump out “new” perfumes accompanied by big PR campaigns. These days, Calvin Klein releases one junky scent after another: scents designed to appeal to the easily satisfied “fragrance” customer who cares little about originality or the quality of the ingredients in their “perfumes.” These folks must “need” a bottle of perfume the way they need deodorant and toothpaste; perfume is a product you use every day and you don’t worry too much about it. It’s unfortunate that Calvin Klein perfumes are so mediocre now; in the past, Calvin Klein put out some interesting and (for their time) innovative perfumes: Eternity, Obsession, even Escape and ck one. Over the years the quality of those original perfumes seems to have waned. Encounter is feeble: a standard-issue, inexpensively made department store fragrance designed to make money. Calvin Klein must think “real men” smell unapologetically cheap. 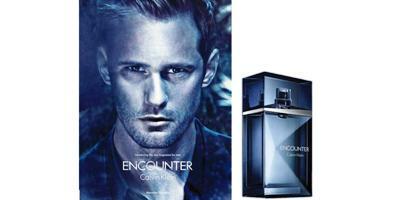 Calvin Klein Encounter will be available in 30, 50 ($58) and 100 ($72) ml Eau de Toilette and in matching grooming products. A home brewer and yarn spinner, who uses a typewriter and the sort of mail which is picked up on a hard copy by a uniformed U.S. employee and through a complex series of trains, plains, automobiles and sorters is delivered on hard copy to someone else, probably by a different uniformed person? This seems like an Old Spice, or Habit Rouge man, rather than a new fangled CK guy. D: that guy would probably stock up on vintage perfume or wear naturals? I knew this would be a huge *yawn* but thanks for the review just the same Kevin. As a side note: Mr. Klein sold off the CK name years ago and these days has nothing to do with the products that bear his name. Sad; if he were still actively involved, I wonder if half these dreadful, anemic juices would ever make it to market. Say: no doubt the residuals are a balm of sorts? As I understand it, he receives nothing now. The apparel arm is wholly owned by Van Heusen and Coty Prestige holds the license for cosmetics/fragrances. I dunno, I can be a little apologetically feminine, sometimes! So, is there a scent that you *would* describe as unapologetically masculine? One that really takes you by the balls and says “HOOooo-aaahh!”? MR: maybe the old Eau d’Hermes…and that had a woman customer in mind! Yatagan? There are some no holds barred MPG masculines. One was so strong I got rid of the sample. Don’t remember the name, though. NOZ: Route du Vetiver? My fav. vetiver ever! Gosh, doesn’t sound good at all lol. I pretty much left CK when they came out with CK One. But..I do really like Euphoria and Forbidden Euphoria..I own them and enjoy wearing them:). Hi Omega, Euphoria isn’t my style (even tho I think it’s a well done perfume), but wanted to tell you I had a deluxe sample of the body lotion and by lotion standards it was a REALLY good lotion. Wish I liked the scent better, but recommending the lotion. *Euphoria for women…the men’s I just didn’t really get much out of. I don’t get how Coty can do great things for brands like Balenciaga, Chloé or Bottega Veneta and yet, choses deliberately to make things that smell like body sprays for CK and Marc Jacobs. Don’t people expect more for their money when they buy designer brands? Or were they all brain washed when they were teens by Ann Gottlieb with her Bath and Body Works and Axe consulting? I suppose the perfumers are at the mercy of the the companies they’re creating the fragrances for…and if CK is miserly with the budget (and clearly, they are stingy), that’s reflected in the final product….and things like Encounter are foisted upon us. Say: thankfully, we can ignore them…and move on to the other 100 new releases. There is no doubt in my mind this is the reason for stagnating to anemic sales growth in the fragrance market. I’m not surprised, but a little disappointed. When I first read the notes, I was hopeful and the bottle is quite nice. I agree that its a shame that a once innovative house has sunk so low. I tried it and it was a close encounter of the generic kind. Ha. Sounds like the complete opposite of what I imagine Alexander Skargard to smell like. (Is it weird that I have imagined what he smells like?) He needs to smell like glaciers and cold greenery, sunlight dappled forest floors and with leather and suede. Mind you, looking like he does he could wear any scent couldn’t he? Okay, fan-girl shutting up now! FW: you HAVE given it much thought! Fragrantwitch, your description sounds like a dream Lutens mash-up! That’s too funny….I often wonder….”Hmm, I wonder what he/she smells like.” I’ve got way too much free time on my hands! I just tried JP Gaultier’s Le Male yesterday (well it was only yesterday that I tried it, ‘got it’ and promptly fell in love with it) and I can actually see Eric, if not Alexander wearing it. A sort of spicy-fresh, ironic scent – strong, distinct and airy, all at once! Did I mention flamboyant? Merlin: how did you avoid it so long????? Well, I think I actually did smell it before, but just didn’t like it. I may have tried Fleur du Male straight after or straight before and have received a really bad impression as I’m often quite aversive to orange flower (dominant in FdM, though not in Le’ Male). Also, now that I am accustomed to so many more notes I am no longer repelled by strong scents my brain just can’t process! Lavender is a note I really didn’t like, but which I can now take – in very small doses; and I love both cinnamon and spearmint. So when I realised I loved it I checked up on your review and was glad to get professional confirmation! Sounds like Encounter is doing the apologizing for the unapologetic man who’s supposedly wearing it. We now know the reason for the existence of this fragrance: To have Kevin write a review of it! Priceless! I am always interested in your point of view, and this was so fun to read. Thanks! ami: don’t know if the perfume will inspire laughter when you sniff it, but glad I did. yes, i loved how you pointed out how stupid their ad copy was, those ad people love to use words like “unapologetically masculine” because they know that gender anxiety can be exploited for big bucks. Hope this one is a failure! I agree with Marjorie Rose above – the snarkier your reviews are, the better! But inquiring minds want to know… just what do you do with your home dyed yarn?? R: oh. That is just a fantasy but I could imagine knitting myself some fingerless gloves for outdoor typing? Making capes for the hens? I think my husbands t-shirts are, very regularly, unapologetically masculine The only mass market men’s fragrance I’ve been impressed with lately is Spicebomb. You think not? Spicebomb strikes me as very mass except for the distribution which began as single-store exclusive, but packaging, bottle design, “manly” quotient, print ad with Axe-looking model, all very mass, and very well done. Flowerbomb is as mass as they come, maybe if you give Spicebomb some time? Eva: sometimes you’re given money to work with! I couldn’t agree more, CK’s men’s fragrances have been lacking to say the least in recent years. I haven’t tested Encounter yet but I doubt I will. I think the last Ck perfume I bought was One, years ago now..
Kevin, nice review thank you. You have earned yet another pin in that voodoo doll shaped after you and that they have hanging in those big buildings in Manhattan. You know what struck me? It’s the fact that when a super niche fragrance (think Arquiste or Vero Kern) is reviewed on NowSmellThis, at least one comment from a reader indicates that someone else smelled it. And here’s a mass market release that sounds so distasteful but where not a single comment posted shows that anyone else even tried it! Do we need to start thinking that perhaps “true perfumistas” like most readers of this blog are a breed apart? A corollary of this would be that Encounter could potentially turn out to be a huge hit with non-perfumistas. If it does, we should all drink some grape flavored Kool Aid and end it since this world would become intolerable. Eric: THAT explains my chronic back pain!!! A little male voodoo doll hanging upside down from a hot lightbulb somewhere in manhattan or NJ! I can’t believe Encounter will be a huge hit, but who knows. If it IS. Lets console ourselves with champagne instead of grape Kool-Aid! And the commercial for Encounter is unapologetically melodramatic! I bought a bottle of “Encounter” without first trying it. The notes described in the press release sounded so promising. It’s not inoffensive, just totally bland and pointless. Wow, that’s awful, when it’s too bland even to rise to the level of inoffensive! Kate Part Deux: nevermind…I see what you mean! Rob: I was about to crack your knuckles for buying unsniffed but did the same thing last week with another perfume. Thankfully, it worked out better! HA! I read your opening paragraph and immediately thought of Dylan, the Victrola-toting anti-modern hipster played by David Cross on Mr. Show. JUPITER’S THUNDERS! Olenska: I’ll have to check it out. Unapologetically masculine calls to mind Charles Bronson in Mandom – NOT a skinny blond guy who doesn’t look like he’s having much fun! Though I thoroughly enjoyed reading the review, I doubt I would bother trying this on… Unless it has something objectionable and intriguing in it. Ayala: nothing one bit “interesting” in this one. Another Skarsgard fan here – though I do prefer him with long blonde hair! I agree with Fragrantwitch about how he OUGHT to smell – at least in his viking guise. Merlin: I’d love to know the GOOD Boss! Huh! I’ll check up on it and get back to you! Wonderfully bitchy review – and probably very deserving! Sometimes you need to just let rip! I enjoyed reading this, thank you! I smelled this yesterday…and it’s crap. lol. i like the ad & video on their own.. but again the tag ‘unapologetically masculine’? is it because of the blue tint?.. not so for me.. dark and nice, yes.. I tried some on yesterday, and uh, came home and washed it off. I had a Calvin Klein MAN flashback. I have this new from Calvin and wore it today…I do like it. Encounter is very generic and you can definitely smell the family resemblance. It is very marine, until it starts to dry down; the marine never leaves, but the oud is soft which makes this a warm, inviting fragrance without being loud. I am one guy who actually really likes this fragrance and most of Calvin’s. Yes they are very generic but different enough to like. I also really like Euphoria Intense for Men as well…LOVE, LOVE, LOVE Obsession and Eternity! But fragrance is art, it’s all in the perception of the wearer! Kevin DID NOT like this new offering, however, I very much did…yes, I do agree with his review, but still enjoy it nonetheless.